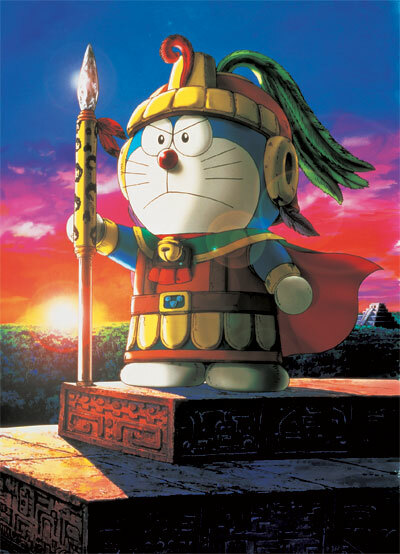 Making use of a secret tool, "Dimension Hole", Doraemon and Nobita went into an ancient jungle and found themselves totally lost in an ancient civilization, where they met a prince who looked exactly the same as Nobita did. The prince, named Odi, was from Mayana, the Kingdom of Sun. The queen, bound by a curse cast by the witch Ladina, was unable to wake from a trance. In order to save his mother, the prince has to beat Ladina. Avoiding Ladina's curse, Prince Odi hide himself in the jungle to practice martial arts and was extremely interested in the modern Japan described by Nobita. The prince decided to swap his life with Nobita, so the prince became Nobita, and Nobita became the prince, trying out their new lives. Although the prince and Nobita looked alike, their personalities weren't similar at all. Will they be able to crack Ladina's curse at the end? An adventure, which spans over different dimensions, is about to take place.